We’ll wrap this up tomorrow night with some thoughts on individual players and awards, but let’s do the last of the six divisional previews first. the bullpen is the team’s top asset). the others following in a jumble I can’t quite yet discern. Jack Zduriencik was one move away from completely rebuilding a shaken franchise in a little over thirteen months. And then he made the move. How much easier could this be to understand? You do not trade for Milton Bradley. You do not trade for Milton Bradley. You do not trade for Milton Bradley. He’s a “good teammate and a nice guy,” said the Mariners’ GM, hours after guaranteeing that all the startlingly good work he and his manager Don Wakamatsu had done in the last year would be washed away by some cataclysm (or “event,” as the nuclear plant engineers pleasantly call them) involving Bradley next season. Since April 1978, when his Dad filled out the name on his birth certificate without his Mom’s consent, there’s always been something. Tearing an ACL while having to be restrained from hitting an umpire. Bumping an umpire. Charging a third umpire. Suspended for the season by the Cubs. Trying to get to the press box during the game to confront the visiting announcer. Fighting with Eric Wedge. Fighting with Lou Piniella. Throwing the baseball bag on the field. Throwing a bottle back into the stands. Throwing the game ball into the stands – after the second out. And by the way, we are talking about a player whose career highs are 34 doubles, 22 homers, 77 RBI, 17 steals, and a .321 average. This is not Albert Belle. This is not even Carl Everett. Statistically, this is a poor man’s Ben Grieve (my apologies to Ben Grieve). And after signing Chone Figgins and Russell Branyan (and maybe even re-signing him), and dealing for Franklin Gutierrez, Jack Wilson, Cliff Lee, Ian Snell, and David Aardsma, all the good work by Zduriencik is undone by adding a player who is being described as looking for a “fresh start.” This’d be his seventh. This was my favorite part of the annual SABR Journal – the curious things the late Al Kermisch found, presumably in pursuit of grander truths (an example from his last “From,” published after his passing in 2002: as a professional, Phil Rizzuto never played on a team that finished worst than third, and in 17 years, he was on 14 pennant-winners). I can’t hope to emulate the quality of Mr. Kermisch’s work but I do hope to touch the curiosity factor, both with nuts-and-bolts research and, in the case of my first effort, whimsy. 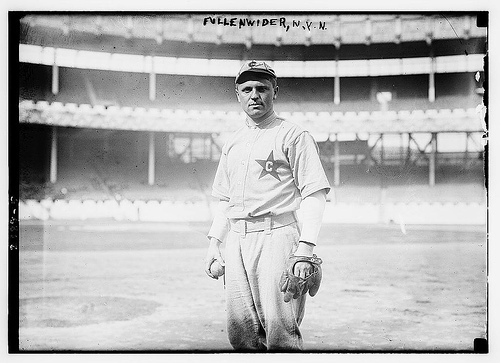 Meet the greatest name in baseball history: Phifer Fullenwider. Don’t go looking him up in the Baseball Encyclopedia; he never actually pitched in the big leagues (though he did make it to Spring Training one year, at a time when less than 30 men per team did so). 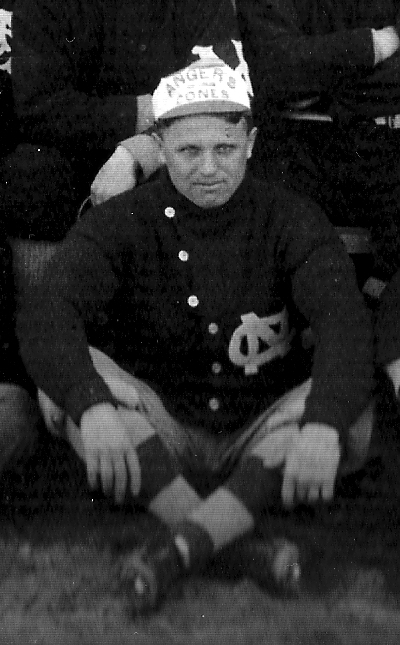 Fullenwider graduated with a degree in pharmacy from the University of North Carolina in 1908, but instead of to a drug store, he headed to the Carolina Association, where, as Baseball Reference’s superb minor league database indicates, he opened a fourteen-year minor league career with a 13-4 record for Charlotte. But it would be 1911 before he really broke through with a 26-9 mark for Columbia of the South Atlantic (SALLY) League. That is none other than our Mr. Fullenwider, in the uniform of the Columbia Commies (had a different meaning then), standing in New York’s Polo Grounds, most likely late in the season of 1911, or possibly early in 1912. In those days before extensive farm systems, major league teams not only drafted players from minor league teams, but did so wholesale – and usually days after the minor league season ended. Thus it was not unusual for “bushers” to report to the big leagues – and apparently to bring their uniforms with them. 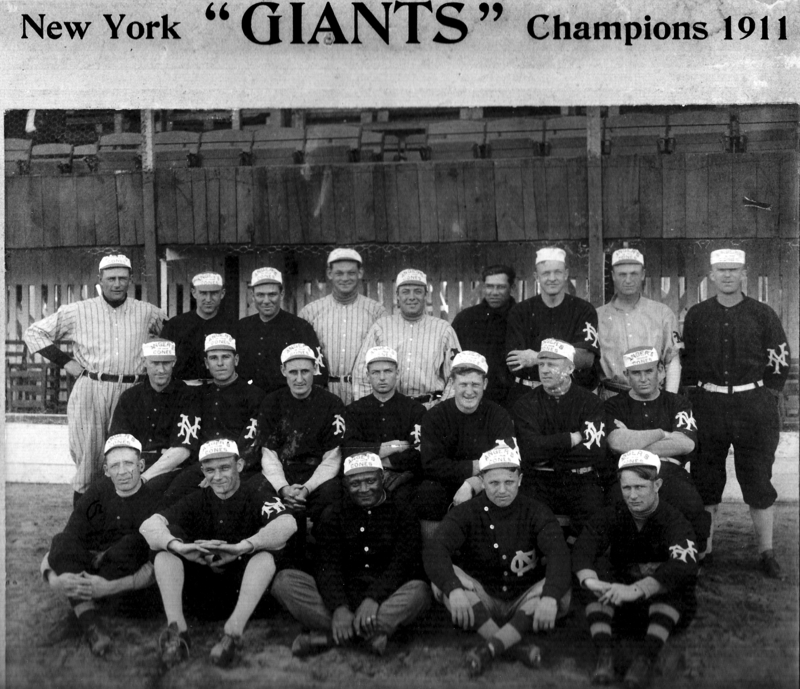 The bottom row is, left to right, Giants aces Red Ames and Hall of Famer Rube Marquard, an otherwise unidentified “trainer,” Fullenwider, and outfielder Josh Devore. The legendary John McGraw is second from right in the middle row (almost right behind his prized pitching prospect), and in the back are the only two guys not wearing the goofy hats: catcher Chief Meyers (fourth from the right) who is capless, and next to him, wearing his cap backwards, Christy Mathewson. For this team photo is nothing less than a 1912 manifestation of that which we purists fear may some day happen in the future – players wearing advertisements on their uniforms! Those caps are ads for “ANGER’S Ice Cream Cones.” And evidently Mathewson and Meyers are having none of it (and yes, that’s my boy Merkle, back row, far right). But back to Phifer Fullenwider, and something even stranger than an ad for ice cream cones on his uniform. The one-time UNC pitching hero is still wearing his Carolina cold-weather baseball sweater. The thing is four years old at least, he’s the property of the defending National League Champion New York Giants, they took him to spring training in hopes that he might pitch alongside Christy Mathewson – and nobody gave him his own Giants’ sweater! ears in the minor league record in that same city – Rocky Mount, pitching for the Tarheels of the Virginia League for two seasons, then Columbia in 1922 and Greenville in ’23. He’d finish up with a record of 194 and 146, with memories of a trip to Marlin, Texas with McGraw and the boys, and at least one winter of the greatest kind of hope and optimism. One wonders if he got to keep the Ice Cream Cone hat. There’s one other note before we let Mr. Fullenwider out of the clutches of the researcher. He may not have gotten a big league game under his belt, but he did make it onto a baseball card. From the Contentnea Cigarettes series called T209, dating from the 1909 season — and a dandy it is, I might add. Hate to see pitchers show up their fielders, even on a dumb play. But even in that context, more power to John Lackey. If he’d gone over and thrown either Erick Aybar or Chone Figgins to the ground after their collective moronity in the bottom of the first in the Bronx, I wouldn’t have made a citizen’s arrest. What Lackey might have done is to check just how thick the hood is, that Aybar is wearing under his hat and over his noggin. I’m not kidding around here; last year a college classmate of mine who happens to be the wife of the owner of the Rays gave me one of the Elmer Fudd Earflap Hats that Tampa Bay and the Phillies wore in the Series, and the first thing I noticed about them was how thoroughly they muffled sound and create an audio disconnect for the wearer. Not quite to the degree earphones or earplugs might, but significantly – and I think it’s safe to assume that the taut headgear Aybar was wearing as he stared at Figgins and they let Hideki Matsui’s pop-up drop between them had the same effect. It isn’t just a question of volume being reduced, but of the creation of the same fishbowl sense you get when you’re really stuffed up, or if you were to climb in the old “Cone Of Silence” from Get Smart. Your head feels like it’s in a cocoon, and you thus feel very detached from what’s going on around you – and sometimes you adjust accordingly. This is not to excuse Aybar but he might have assumed he just couldn’t hear Figgins calling for the Matsui pop. As to Figgins, I have no clue. Maybe his ears had frozen off. Blogging time has been limited here of late but I’ll point out two truths about the Championship Series before they get too far along to make any stupid predictions worthwhile: I still don’t like the idea of starting Sabathia in Game Four (or if the weather is utterly uncooperative, maybe Game Three) but I think the Yankees are the better of these two teams. And as to the Phillies, I’ll point out here the dumbest reason of all time to pick the Dodgers. In my lifetime, the Phillies have made the World Series on three occasions: 1980, 1993, and 2008. I, meantime, have only traveled to Philadelphia to see a Phillies game in person in three years: 1980 (as a fan, and photographer), 1993 (to do play-by-play for ESPN), and 2008 (as a fan). I did not go to a Phillies’ home game this season. I was kinda surprised they didn’t send me a bus ticket or something.